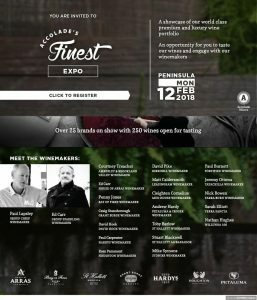 Accolade Wines wants to take the opportunity to invite you to a unique event that we are undertaking in February nationally. For the first time in many years Accolade Wines is showcasing all of its premium wine portfolio to the trade. As our portfolio has expanded to include brands such as Grant Burge, Petaluma, St Hallett, and Stonier along with multi-awardwinning wines under Hardys, Houghton and House of Arras it is the perfect time for you to familiarise yourself with the unique portfolio offer that we now have at your disposal. Market growth for premium wine (those wines above $15 retail) continues to drive the growth in the market. The total market is up 5% over the past year while +$15 wines have grown over 10%. Wine under $15 has grown a mere 1%. Accolade Wines is excited to provide you with the insight and stories that have made our premium wine portfolio one of the strongest in Australia. Please join us and hear about the exciting opportunities that lie within these brands, direct from the winemakers responsible for them.